SAM’S FIRST PAINTING OF AMELIA! 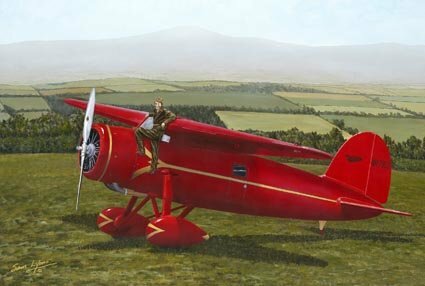 On May 20, 1932, Amelia Earhart took off from Newfoundland, Canada, at 7:12 p.m. in her magnificent red Lockheed Vega. She intended to fly to Paris to copy Charles Lindbergh's solo flight. Her flight was filled with dangers, from rapidly changing weather to a broken altimeter, to gasoline leaking into the cockpit. When she brought her plane down after 15 hours and 18 minutes (according to one account) she wasn’t in Paris. Instead, she landed in a pasture at Culmore, north of Derry, Northern Ireland. When a farm hand asked, "Have you flown far?" Amelia famously replied, "From America." The site now is the home of a small museum, the Amelia Earhart Centre. Sam decided to focus on one of Amelia’s most successful flights. That airplane is a beauty and Sam captured her famous face to perfection.